Because I already wrote a long-winded discussion of Star Trek: Enterprise’s second season back when I reviewed the DVD in 2005, I’ll omit a repetition of those comments here. If you’d like to peruse my episode-by-episode examination of Season Two, please click the link offered in the last sentence. To summarize my impressions: Season One had its moments but was too inconsistent to really draw me in to its characters and situations. This improved during Season Two. Sure, it still wasn’t terribly consistent, but I could say the same of virtually every Trek series. Season Two showed Enterprise on the upswing and served to give us a good year of Trek. Star Trek: Enterprise appears in an aspect ratio of 1.78:1 on these Blu-ray Discs. Though the shows looked decent, they never seemed much better than that. Sharpness was the most prominent issue, as the episodes tended to lack great definition. Close-ups offered good clarity and two-shots were fine, but wides failed to demonstrate the accuracy that I expect from Blu-ray. Jagged edges and shimmering created no concerns, and I also noticed no problems with edge enhancement. Source flaws appeared absent, as I didn’t discern specks, marks or other distractions. The palette varied depending on the context of the episode. Much of the time the colors were a bit restrained, but sometimes they took on more dynamic tones. Overall, they seemed mediocre; while the hues weren’t unappealing, I felt they lacked much life. Blacks seemed acceptable, while shadows were okay and that was it; low-light shots tended to be a bit on the murky side. I didn’t think the episodes looked bad, but they remained pretty average. I felt the DTS-HD MA 5.1 soundtrack of Star Trek: Enterprise worked fine for the material. Admittedly, I think the track should give us more “bang”. As the most modern Trek series, I expected more pizzazz from the mix, but the audio could be a little too laid-back for my liking. Nonetheless, the track succeeded for the most part. The audio stayed mainly focused o the front channels and created a good sense of life in that area. It used the forward speakers to form a realistic and rich feeling of ambience and moved elements about quite cleanly. As for the surrounds, they tended to echo material from the front. They became more active at times, especially during battles and fly-by shots, but they weren’t particularly involving on a consistent basis. I encountered no concerns with audio quality. Effects portrayed the material well, as they brought the elements to life with good clarity and definition. Music also seemed full and bright, with solid dynamic response. Speech seemed distinctive and concise, and I noticed no problems attached to the lines. This wasn’t a stellar soundtrack, but it was more than acceptable. How did the Blu-ray compare to the original DVDs? Audio came across as somewhat more robust and full, and visuals showed improved clarity and accuracy – well, to a degree. If you compare DVD and BD grades, you’ll see I went from an “A-“ for the DVDs down to a “C+” for the BD. That doesn’t mean the DVDs looked better, of course, as I awarded grades based on the formats involved. Back in 2005, I thought Enterprise looked great for DVD – and on a smaller TV - but on Blu-ray in 2013 via a 50-inch plasma, the results seemed less pleasing. Whether or not this reflects the original footage or the transfer remains up for grabs. The Blu-ray’s packaging doesn’t mention remastering done for this release, and that makes me suspect that they simply used the same transfers created for the 2005 DVDs. Whatever the case, I still feel like Enterprise looks awfully soft for a TV series shot barely a decade ago. Shouldn’t it present more concise and dynamic visuals than 25--year-old episodes of Next Generation? I think so, but it doesn’t. I simply can’t answer if this stems from the original photography or from the transfer used here. The Blu-ray mixes old and new extras, and we find audio commentaries for five episodes, two of which appeared on the original DVDs: “Dead Stop” and “Regeneration” with writers Michael Sussman and Phyllis Strong. The pair sit together for their running, screen-specific discussions. They go over the genesis of the stories, their themes and connections to other Trek, and some specifics about their elements. They also discuss reactions to the shows and some positives and negatives they perceive. “Regeneration” gets most interesting when they talk about the passionate criticisms they got from fans, and they attempt to defend themselves against these. Expect a lot of tap-dancing as they try to justify putting the Borg in this series. Neither track shines, but both offer more than enough good information to deserve your attention. “First Flight”: Black, Michael Okuda and Denise Okuda. Given that they’re married in real life, Billingsley and Friedericy show the ease and chemistry together we’d expect. They don’t tell us a ton about working on the series, though. Instead, they tend to joke a lot; that makes this a breezy chat but not an especially informative one. The two Black/Okuda/Okuda tracks deliver more meat, however, though we still don’t find a ton of episode-specific material. While we do get some notes about “Creek” and “Flight”, the commentaries tend to focus more heavily on general experiences. That’s fine, as I like Black’s thoughts about the series, and we get more than enough interesting data to allow the commentaries to prosper. Also found on the original DVDs, text commentaries by Michael and Denise Okuda come with two episodes. We find these tracks for “Stigma” and “First Flight”. Like their other subtitle tracks, the Okudas get into props, costumes, visual effects, connections to other episodes/series, sets, guest actors, story points, facts and figures, production notes, and various technical concerns. The commentaries offer lots of good information. Six episodes come with deleted scenes. These accompany “Minefield” (one scene, one minute, 10 seconds), “A Night in Sickbay” (2, 4:02), “Dawn” (1, 1:34), “Stigma” (1, 1:15), “Cease Fire” (1, 0:42), and “The Expanse” (2, 5:00). Many of these offer simple extensions of existing scenes and don’t add much of interest. Even the totally new clips tend to be blah, though I do like the ones for “The Expanse” since they broaden some characters nicely. On Disc One, we get two archival pieces. 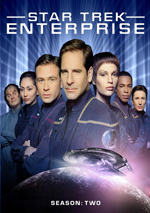 Enterprise Moments: Season Two runs 19 minutes and 11 seconds as it incorporates show clips, behind the scenes shots, and interviews. We hear from Sussman, Billingsley, Michael Okuda, actors Jolene Blaylock, Anthony Montgomery, Linda Park and Scott Bakula, and co-creators/executive producers Rick Berman and Brannon Braga. They discuss “Carbon Creek”, “Shockwave”, “Dead Stop”, “Vanishing Point”, “The Catwalk”, “Future Tense”, “Bounty”, “First Flight” and “The Expanse”. We learn about inspirations, playing the parts, running storylines and aspects of the episodes. Some good notes appear here, though we end up with too many comments along the lines of “that was a great show”. Enterprise Profile: Jolene Blaylock lasts 14 minutes, 28 seconds and includes remarks from Blaylock, Braga, and actors Dominic Keating and Connor Trinneer. Blaylock dominates as she chats about her career, getting the part and aspects of her role, and working on the show. She adds good introspection into her work and its various components. This adds up to a useful and engaging piece. Also, unlike similar pieces attached to other Trek series, this one avoids spoilers for future seasons. I appreciate that aspect of it. For something new, Disc One offers In Conversation: The First Crew. The show lasts a whopping one hour, 33 minutes, 49 seconds and features Bakula, Braga, Blaylock, Billingsley, Park, Keating, Trinneer and Montgomery; frequent guest star Jeffrey Combs shows up after about half an hour as well and Trinneer splits. They discuss how the actors got cast, likes/dislikes/regrets, thoughts about stories/episodes as well as their characters and performances, and other general thoughts about the series. One might expect a reunion like this to engage in hugs ‘n’ happy talk. While the participants show affection for each other, they engage in a surprising amount of negativity related to the series. This doesn’t become a 90-minute gripefest, but it offers a good mix of pleasant memories, regrets and problems. That helps turn it into a better than average piece. 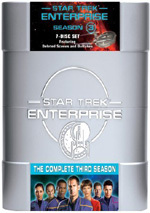 Disc One opens with ads for Enterprise Season One, Next Generation Season 4, Next Generation: Redemption and Next Generation: Best of Both Worlds. 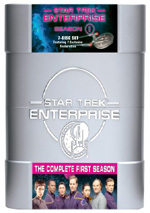 We also find a Series Promo for Season Two of Enterprise. When we shift to Disc Two, we find Inside “A Night in Sickbay”, an 11-minute and 17-second program. It features Bakula, Berman, Billingsley and visual effects supervisor Ronald B. Moore. We get a few bits about the show’s genesis as well as elements of its execution. Some of this is banal, but I like the parts about the visual effects, especially since we get a nice look at the shots before they added those elements. Alongside Disc Three’s “Stigma”, we find Archival Interviews. This five-minute, one-second piece features Braga, Berman, Blaylock, and Bakula. They give us some general thoughts about the episode. Don’t expect much from this fairly banal piece. Disc Three also includes a Photo Gallery. Among its 50 images, we get a mix of shots from the set and publicity pictures. It’s a pretty forgettable collection. Over on Disc Four, Shooting “Future Tense” runs 17 minutes, 16 seconds and includes notes from Bakula, Trinneer and director of photography Marvin Rush. While they give us a little voice-over, most of “Shooting” focuses on raw footage from the set, as it lets us get a feel for a typical day of filming. I like this kind of program and think “Shooting” works well. 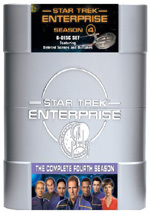 Next comes Enterprise Secrets, a four-minute and 50-second featurette. We hear from first assistant director David G. Trotti as he discusses shooting Rura Penthe. I’m not sure why this counts as a “secret”, as there’s nothing particularly exciting on display here. Disc Five provides background for the actor turned director in the seven-minute and one-second LeVar Burton: Star Trek Director. It includes statements from Burton as he discusses shooting the “First Flight” episode. That focus is something of a disappointment, as I’d have preferred more emphasis on Burton’s overall directorial career and challenges inherent in the shift from acting. Still, he offers a mix of nice notes about the show. In 11 minutes and 12 seconds of Outtakes, we get the usual goof-ups and giggles. Don’t expect anything more interesting than that. With that, we head to Disc Six and three Archival Mission Logs. These appeared as Easter eggs on the original DVD and include remarks from Bakula, Park, and Montgomery. They run a total of eight minutes and 29 seconds. We hear about visitors to the set and the relationship between Hoshi and T’Pol. All three seem pretty insubstantial. We finish with a three-part documentary called Uncharted Territory. It fills a total of one hour, 28 minutes, and 40 seconds as we hear from Billingsley, Braga, Sussman, Black, Berman, Bakula, Park, Keating, Montgomery, Trinneer, Combs, story editor Andre Bormanis, consulting producer David A. Goodman, CBS Television Distribution Executive VP John Wentworth, and actor Matt Winston. We learn about the series’ growing pains and issues with the writing staff, narrative/character topics and some episode specifics, cast and performances, problems with the studio and the network, dealing with fan criticism and the effects of the Internet, and how the series moved forward to Season Three. Like “The First Crew” on Disc One, “Uncharted” comes with a refreshing sense of candor. In particular, Braga lets loose with unguarded thoughts about “Precious Cargo” – which he calls one of the worst episodes of Trek ever – and fan criticism. Others throw in useful notes as well, and “Uncharted” becomes a strong overview of series-related topics. I know that Enterprise never earned much of an audience, but I don’t think that was because of the series’ quality. Like all Trek, Season Two is erratic, but it improves on Season One and offers a lot of good material. The Blu-rays offer decent picture, positive audio and a nice array of bonus materials. Though the mediocre visuals were a bit of a disappointment, the package still brings home Season Two in a satisfying manner.